Welcome to the second post in our series of Expert Packaging Guides where we take a close look at eco-friendly packaging products and materials, and offer expert guidance on how to select the right packaging to keep your process efficient. Following our piece on Bubble Vs. Foam, we’re moving the focus to two eco-friendly packaging materials; corrugated cardboard and plastic, their properties, suitability for use and impact on the environment. In February we held our annual Supplier Day where eco-friendly ecommerce packaging and the disposal of plastic waste was a popular topic of discussion for suppliers, in response to customer feedback. 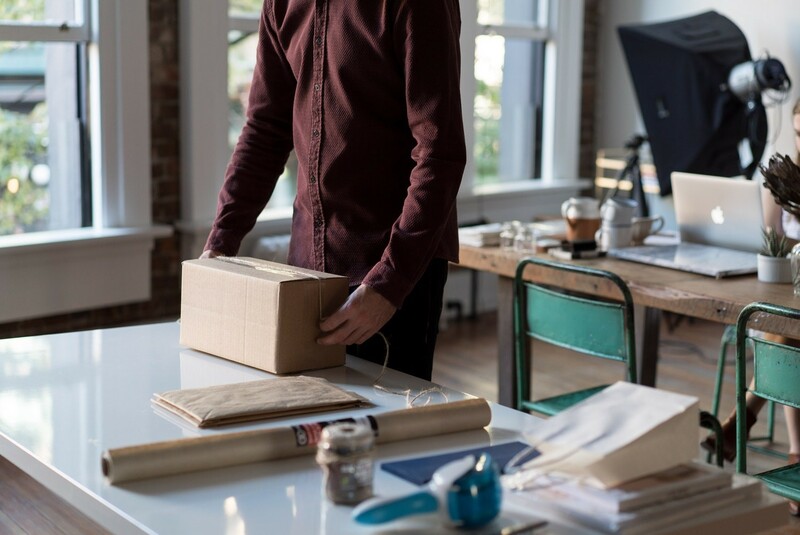 With the growth of the ecommerce industry we’ve seen a massive rise in demand for suitable packaging which is lightweight, low cost, strong and simple to use. With this growth comes increased waste, which is why we provide eco-friendly choices, to minimise any potential damage to the environment and maximise recycling. Our recent ‘Art of Recycling’ campaign focused on recycling in an effort to communicate key messages about this important topic in a unique and captivating way. Combined with the popularity of the Blue Planet II series earlier this year, consumer concern has grown making this a very important subject for customers. When it comes to Ecommerce Packaging, these two materials are most commonly used by customers. They both offer very different properties as a packaging material, and offer different recycling and disposal options. We’re going to cover both in detail later in the article. Corrugated cardboard is no doubt a material you’re familiar with, a strong cardboard box that’s one of the most common packaging materials in use today due to its excellent protection, handling and storage properties. Recently it has experienced price rises as demand has grown from ecommerce businesses, and this is expected to continue into 2019. In the US, demand has continued to outstrip supply as its popularity has continued to grow. Corrugate is made up of a fluting surrounded by an outer and an inner liner, with another layer of fluting and liners used in double walled corrugate for extra strength. This gives it shockproof protection and crushing resistance due to its rigid properties, making it a great choice for postal boxes, in particular book, CD and media boxes. Stored as flat packed boxes, it won’t take up much space in your warehouse and can easily be folded out and assembled when needed making it very space efficient. Widely available, corrugate across our ecommerce range is lightweight too, saving on delivery costs when ordering and posting to customers. 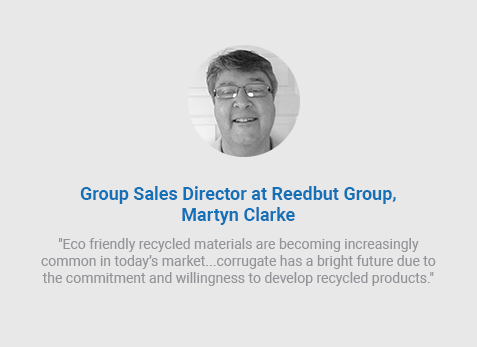 Corrugate is 100% recyclable, and has the highest recycling rates of any packaging in the UK. It can easily be recycled at most homes and businesses along with all paper and card. The recycling loop is widely recognised as used boxes can be recycled, remade and reused in just two weeks. Q: What changes have you seen in your industry to corrugated? A: Our industry has undergone significant changes over the last 5 years as it is challenged to produce more environmentally friendly products. The need for a box to be able to be used on numerous occasions is beneficial for customers from both a cost and carbon footprint standpoint and having them made from already recycled materials adds to the environmental credibility of corrugate. Q: How have the materials and products improved in use and cost? A: Eco friendly recycled materials are becoming increasingly common in today’s market. The ability to offer the customer a box that is ‘fit for purpose’ using a recycled performance grade offers the ability to challenge historically used board grades and flute profiles. Potential cost savings are therefore achievable through both unit price reduction, larger pallet quantities and material availability. Q: What do you see in the future for corrugate? A: Sustainability is the latest buzz word in the industry and accreditation to FSC or other such governance is essential. Corrugate has a bright future due to the commitment and willingness to develop recycled products. This means that corrugated cases can be made from 100% recycled materials and be 100% recyclable with the aid of a completely closed loop recycling system. Very few direct alternatives to corrugated can offer this facility. We are in the process of developing our core range of performance boards as well as bringing a competitive edge and design focus into the largest growing sector of Ecommerce Packaging. Plastic has had a lot of publicity recently due to the large amount of waste found in some of the world’s beauty spots and its effect on the environment. The critics argue that this is mainly due to poor disposal rather than the properties of the material itself. As a packaging material plastic is lighter and thinner than paper and card alternatives, resulting in reduced fuel consumption when transporting, reducing greenhouse gas emissions versus bulkier paper and card. Many plastics are now recyclable too, meaning they can be remade into future packaging efficiently, maintaining their excellent properties time and time again. Plastic offers many benefits as a material; it’s weatherproof, tearproof and lightweight, with some offering puncture resistance as well as protection from extreme hot and cold temperatures. This level of protection can mean less spoiled parcels, reducing waste and returns. Plastic is lighter and stronger than paper and card packaging, and plastics and polyurethane foams usually provide better protection for the least resource used, making them a sustainable option. It’s a material that is seeing continual development in manufacturing and innovation too with increased uses of recycled plastic, more reuse, and a reduction in energy consumption during manufacturing as technology improves. “Given all the recent publicity, it is not surprising that people are looking at alternatives to plastic packaging, with paper and pulp as the most common considered. 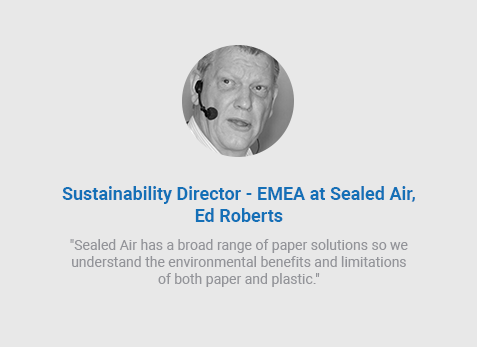 Sealed Air has a broad range of paper solutions so we understand the environmental benefits and limitations of both paper and plastic. Paper is usually considered to be environmentally friendly but you may be surprised to learn that it has its concerns. According to the International Energy Agency, paper and pulp production in 2014 consumed 5.6% of the world’s industrial energy requirements. The IEA have also said that the paper and pulp industry must cut direct non-biomass CO2 emissions by 17% by 2025 from 2014 levels to meet the requirement of the Paris COP-21 agreement to limit global warming. There will be many situations in which paper for void fill and/or cushioning will be perfectly adequate and sustainable. But even the most basic of mobile phones produces about 60 kilograms of greenhouse gas during its manufacture, non-paper solutions such as plastics and polyurethane foams can usually provide better protection with less resources used, being the most sustainable option. Eliminating plastic would likely increase your material, warehousing and logistics costs, could increase damage rates and potentially be more detrimental to the environment. The majority of Sealed Air products are already recyclable. We are continually innovating and collaborating with other organisations to develop the infrastructure and technologies required to make all plastics recyclable. As well, most Sealed Air products can be reused and many customers keep the packaging for future use. It is necessary to dispose of the material, polyethylene materials (such as Bubble Wrap™, Fill-Air® Air Bags and Cell-Aire®) can be put into the shopping bag recycling bins found at many supermarkets and recycling centres. In Summary – Which Material is Right for You? Making the right choice between which material is best for your needs is something that should be considered across a range of factors; what type of item you’re packaging, what protection it will need, where it will be stored, how it will be shipped, and what storage space you have are just a few things to think about. Corrugated offers medium and heavyweight protection thanks to the properties of the material, which excels as protecting from shocks, knocks and crushing. Heavier than plastic, it can be slightly more expensive to ship but is straightforward to recycle, and most of what you can buy is 100% recycled already, so it won’t go to landfill and has an excellent recycling loop here in the UK. Plastic offers excellent all-round protection in the form of puncture, tear and shock resistance. It’s more weatherproof than corrugated solutions too, meaning there’s little concern about moisture, damp, or hot and cold temperatures. Recycling for plastics isn’t generally as efficient as paper and card, though it’s lightweight properties mean less impact on the environment when transporting and delivering. Some products combine the strengths of both materials and are still fully recyclable, such as padded paper mailing bags (a favourite of ours) so you can get the benefits of both while keeping things eco-friendly. Finally, we spoke to Joe Wille, Field Sales Manager here at Rajapack UK, to get his thoughts on making the choice between corrugate and plastic for ecommerce packaging. “We’ve been seeing a fundamental shift away from plastic with customers looking for other packaging solutions. Being able to provide our customers with alternatives to traditional packaging methods, such as packaging machines that supply biodegradable packaging alternatives is an ongoing aim for us here at Rajapack. Going green shouldn’t cost your business more, and we’re here to make customers aware of the choices available, providing them the knowledge to make the right choice for their business. Some customers are not necessarily looking for eco-friendly products but are drawn to what looks eco-friendly. Part of what we do is to educate buyers on what is eco-friendly and why it is, ensuring that the packaging they use will have a real, positive impact on the environment, moving customers to biodegradable options where possible. If you’d like further information on ecommerce packaging, or help choosing the right eco-friendly packaging for your business, simply get in touch with our team of packaging experts who are on hand to help. Simply visit www.rajapack.co.uk or contact our team on 0800 542 44 28. This entry was posted in Environmental packaging, Packaging Industry News and tagged eco-packaging, Environmental packaging, Reedbut, Sealed Air on April 20, 2018 by Rajapack UK.